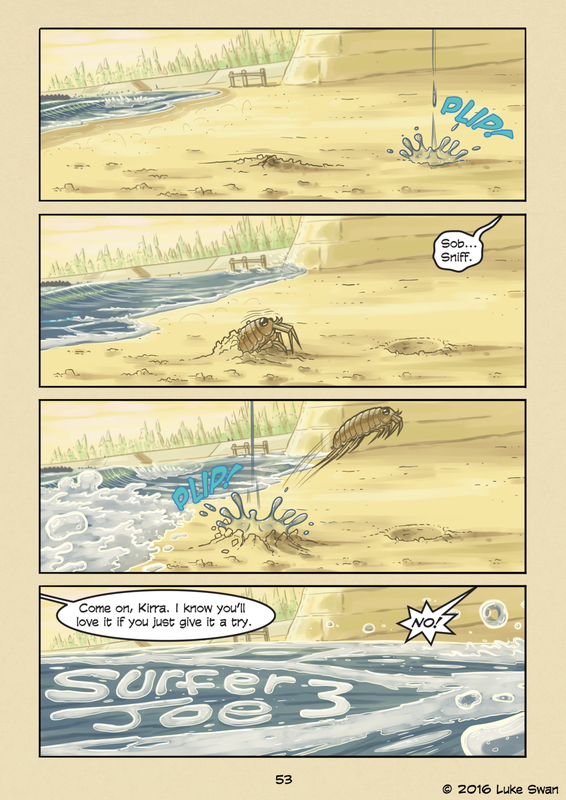 Sand Flea (#053) | Web comic "Surfer Joe"
Sand fleas may look cute, but they are vicious little creatures. They’ll bite you pretty much out of spite. I guess given their size and environment I don’t blame them. They hide in burrows in the sand while waves crash over them. And when the water subsides the come to the surface to jump around and look for food. I wonder if they bite because they are in such a hurry. They must have some internal timer in their heads or something. Gotta get a nibble before the next wave hits. I doubt they get under the sand again before they get washed away. They must have another way to get under… but I’m too lazy to google it. On another note, we’re kicking off chapter 3! Yay! I’m super stoked to get started on it. Sorry for the wait… It was a long time off, but I had a lot of other things to take care of in the meantime. I didn’t really get any of it done, all in various stages near completion. The web store will be receiving a substantial update in the coming weeks, so be on the lookout for that. There should be a slew of new items there, including print versions of chapters 1 and 2. Also, Surfer Joe will have a booth at Interstyle in Yokohama February 13th-16th. Details will be forthcoming in the coming weeks. I’m pretty excited for the opportunity to meet all the various people in the surfing and extreme sports industries. Looking forward to introducing myself. Thanks for waiting. I think Chapter 3 will be an exciting one, although light on the surfing. I hope you all enjoy it!